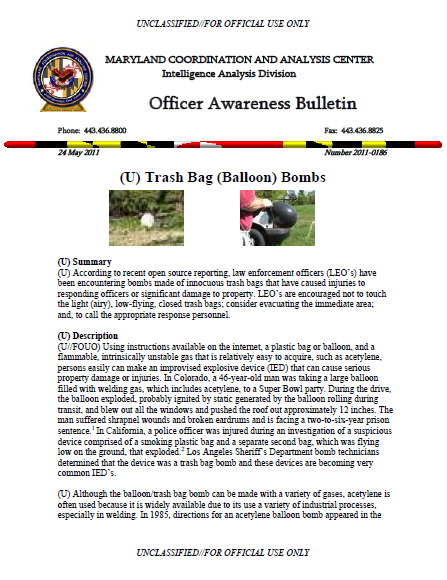 (U) According to recent open source reporting, law enforcement officers (LEO’s) have been encountering bombs made of innocuous trash bags that have caused injuries to responding officers or significant damage to property. LEO’s are encouraged not to touch the light (airy), low-flying, closed trash bags; consider evacuating the immediate area; and, to call the appropriate response personnel. (U//FOUO) Using instructions available on the internet, a plastic bag or balloon, and a flammable, intrinsically unstable gas that is relatively easy to acquire, such as acetylene, persons easily can make an improvised explosive device (IED) that can cause serious property damage or injuries. In Colorado, a 46-year-old man was taking a large balloon filled with welding gas, which includes acetylene, to a Super Bowl party. During the drive, the balloon exploded, probably ignited by static generated by the balloon rolling during transit, and blew out all the windows and pushed the roof out approximately 12 inches. The man suffered shrapnel wounds and broken eardrums and is facing a two-to-six-year prison sentence. In California, a police officer was injured during an investigation of a suspicious device comprised of a smoking plastic bag and a separate second bag, which was flying low on the ground, that exploded. Los Angeles Sheriff’s Department bomb technicians determined that the device was a trash bag bomb and these devices are becoming very common IED’s. (U) Although the balloon/trash bag bomb can be made with a variety of gases, acetylene is often used because it is widely available due to its use a variety of industrial processes, especially in welding. In 1985, directions for an acetylene balloon bomb appeared in the first volume of Phrack, an e-zine written by hackers. Cautionary notes in the article indicate that acetylene is “fairly dangerous” and “unstable upon contact with oxygen (air),” and a simple static spark is capable of igniting acetylene. Therefore, a trash bag bomb filled with acetylene does not necessarily require a fuse that a LEO could easily identify. (U//FOUO) Propane is another gas that may be used in these bombs because the gas is readily available from grill tanks. While propane can be stored in plastic, time and pressure will cause it to leach out of the bag. Once the concentration of propane is greater than ten percent air, it will no longer ignite. Also, propane requires an ignition source (a flame or spark), a visual cue that should tip off LEO’s and provide the time to respond accordingly. (U//FOUO) Directions on the internet as well as videos posted on YouTube provide numerous examples for persons to create trash bag/balloon bombs filled with gases. Persons can use these bombs as IED’s or incendiary devices that can cause problems and injuries to LEO’s. Officers encountering low-flying trash bags or balloons should avoid touching or piercing the bags, consider evacuating the area, and call appropriate response personnel.